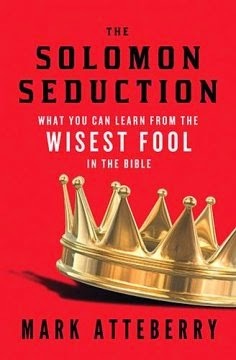 Mark Atteberry was the same author who wrote The Samson Syndrome and his next offering is The Solomon Seduction: What You Can Learn from the Wisest Fool in the Bible. This book is a look at King Solomon who was known to be the wisest person in history who ever lived. His wisdom was granted to him by God when he chose to ask God for a discerning heart to govern the Israelites and distinguish between right and wrong. Together with wisdom, God granted him riches and honor. This did not guarantee, however, that Solomon would not get blinded and not see through Satan's deceptions. Mark Atteberry's The Solomon Seduction shares ten "wake-up calls" to rouse those who are falling into the enemy's enticement. We, each, may be considered a smart, accomplished guy, a man to whom people look for inspiration, leadership and advice, but if Satan was able to seduce Solomon who was sharper than any of us, why not us? The Solomon Seduction is a great source of practical suggestions for how this can be avoided. This is especially recommended to pastors, lay ministers, and anyone in secular leadership.